Tree Tops is a new 55+ community coming to Lancaster, South Carolina. This gated active adult neighborhood will be sprawled across 613 acres of lush landscape and consist of 799 single-family homes upon completion. The community will feature a rich lineup of indoor and outdoor amenities that will provide active adults with a fun and social environment. A 10-acre lake as well as plenty of parks and open space will cater to the adventure seeker and outdoor enthusiast where they will enjoy scenic views of this natural oasis. Located in the Charlotte metropolitan area, residents of Tree Tops will have everything they could want or need. The area is full of culture, attractions, and entertainment as well as major roadways that make planning a day trip easy. This 55+ community will have resort-style amenities that cater to active adults, nature lovers, and outdoor adventurers. Plans for a world-class clubhouse will feature a state-of-the-art fitness center where residents can stay in shape without having to travel far from home. It will also have plenty of spaces for socializing with friends such as a hobby and game room and multi-purpose room. Outdoor amenities will also provide plenty of areas for recreation and physical activity. An outdoor resort-style pool and spa will be on hand for a refreshing dip on a nice day. Neighbors can relax on the patio or by the fire pit on a quiet evening. There will be multiple sports courts like tennis, pickleball, and bocce ball to challenge a friend. An amphitheater will be the perfect place to watch an event. A rookery, 10-acre lake, and plenty of parks and open space will be great for appreciating birds, flowers, plants, and other natural beauty while walking or biking throughout the neighborhood's trails. Residents will also have access to the Village Center, consisting of ten log cabin-style buildings for recreational facilities. It will include a celebration room, business center, card room, sewing room, and nature room. Lennar Homes began construction of this age-restricted community in 2016 and will build 799 single-family homes upon completion. Homebuyers will love knowing their homes are designed with quality materials, energy-efficient designs, and low-maintenance exteriors that are perfect for active adults. There are eleven floor plans to choose from in The Groves collection. These single-family homes range in size from 1,436 to 2,762 square feet. They have two to four bedrooms, two to three bathrooms, and an attached two-car garage. These homes offer one and two-story residences, all with first-floor master suites. Some features include open layouts, great rooms, gourmet kitchens, luxurious fixtures, plenty of storage space, and covered porches. The Summit collection has more space and includes four dynamic floor plans that offer 2,475 to 3,619 square feet of living space. These single-family homes have three or four bedrooms, two-and-a-half to three-and-a-half bathrooms, and an attached three-car garage. These residences feature spacious family rooms, elegant first-floor master suites, beautiful dining rooms, and plenty of options for personalization. This vibrant age-restricted community will feature a long list of activities, events, and clubs specially designed for active adults. Residents will be able to organize teams or leagues to participate in sports like pickleball, bocce ball, and tennis. They can also start a new club based on similar interests like sewing, arts and crafts, nature, or fitness. As the neighborhood welcomes more homeowners, there are sure to be more activities and events that will cater to everyone's hobbies and get them socially engaged with others. Tree Tops is located in Lancaster County, SC. Residents are 20 minutes away from downtown Lancaster where they will find shopping, dining, and medical facilities like Springs Memorial Hospital, Lancaster Square Shopping Center, Walmart, Walgreens, and Westgate Shopping Center. There is also a pharmacy, movie theater, and bank close by. Route 521 is nearby for driving across town. For big-city entertainment, homeowners can drive about 50 minutes to Charlotte, NC. Here, they will find a variety of museums, historical landmarks, cultural attractions as well as several parks and golf courses. Charlotte Douglas International Airport is also nearby for traveling longer distances. Tree Tops will be the ideal 55+ community in Northwestern South Carolina. 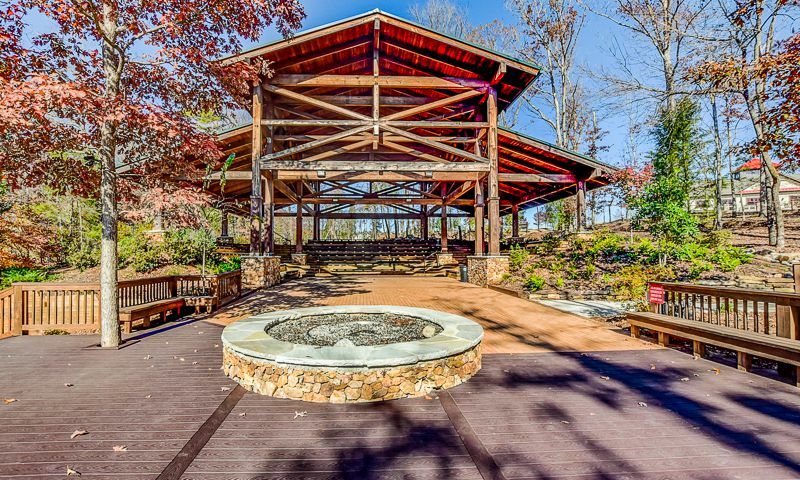 The Village Center will provide ten log cabin-styled buildings for additional recreation. There are plenty of activities available in Tree Tops. Here is a sample of some of the clubs, activities and classes offered here. The Meadows offers 12 floor plans ranging in size from 1,677 to 2,973 square feet. It includes homes that have two to four bedrooms, two to four bathrooms, and attached two-car garages. Some homes in this collection have two stories. We bought here because of the location. We visited most of the communities in the Charlotte area, but we fell in love with the lots in Tree Tops. We have been very happy with the construction process with Lennar and the sales team. We've already met many of our neighbors and are so excited to start the next chapter of our lives! 55places.com is not affiliated with the developer(s) or homeowners association of Tree Tops. The information you submit is distributed to a 55places.com Partner Agent, who is a licensed real estate agent. The information regarding Tree Tops has not been verified or approved by the developer or homeowners association. Please verify all information prior to purchasing. 55places.com is not responsible for any errors regarding the information displayed on this website.